While Siberian are, on the whole, a very healthy breed, there is a few issues you should be aware of before purchasing your Siberian Husky. While hip dysplasia is not common in the breed, it is a good idea to purchase your pet from a breeder who has had the parents hip certified free from hip dysplasia. This certification can be done by OVC (Ontario Veterinary College), OFA (Orthopedic Foundation for Animals), or PennHIP. The SHCC Code of Ethics requires all of our members to screen breeding dogs for hip dysplasia and ophtalmologic diseases. Eye disorders including juvenile cataracts, corneal distrophy (CD) and progressive retinal atrophy (PRA) all occur within the breed. Parents of puppies should be screened by a CERF board certified canine ophtalmologist. The dog may also have a SHOR (Siberian Husky Ophtalmologic Registry) number. SHOR is more common in American dogs than Canadians. 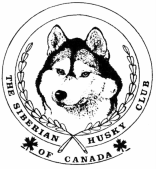 The Siberian Husky Club of America (SHCA) has many wondrful brochures explaining in detail the above diseases. Consider visiting their website (www.shca.org) for more research on hip and eye disorders. Your breeder should always be available to discuss health and temperament issues with you.